BUENOS AIRES, Argentina (CNN) -- All 122 people aboard a cruise ship stranded off Antarctica have been evacuated and are "in perfect health," the Chilean navy said Friday. 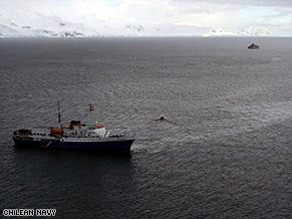 The cruise ship "Ushuaia" is seen stranded off the coast of Antarctica. The Panamanian-flagged Ushuaia was carrying 89 passengers and 33 crew members Thursday when it struck ice and began to take on water and lose fuel, the Argentinian navy said. The ship is owned by an Argentine. Two helicopters and two Chilean navy ships were dispatched to the scene to assist, though the Ushuaia was never in danger of sinking, the Chilean navy said. Passengers were transferred to the Achilles, the first ship to arrive, which carried them toward the Chilean Antarctic base Eduardo Frei, the navy added. Those aboard included 14 Danes, 12 Americans, 11 Australians, nine Germans, seven Argentines, seven British, six Chinese, six Spaniards, five Swiss, three Italians, two French, two Canadians, two Irish, one Belgian and a New Zealander. The crew aboard the Chilean navy's Lautaro, the second ship to reach the crippled Ushuaia, was working to stem the fuel leak, the navy said. The Ushuaia was sitting about 300 kilometers (186 miles) southwest of Argentina's Marambio naval base in Antarctica.